The aged man is the artist himself, the small boy is his young son Gustav Adolf, the young girl is his daughter Agnes Adelheid, the older girl is his daughter Emma, and the man in the top hat is his nephew Johann Heinrich. 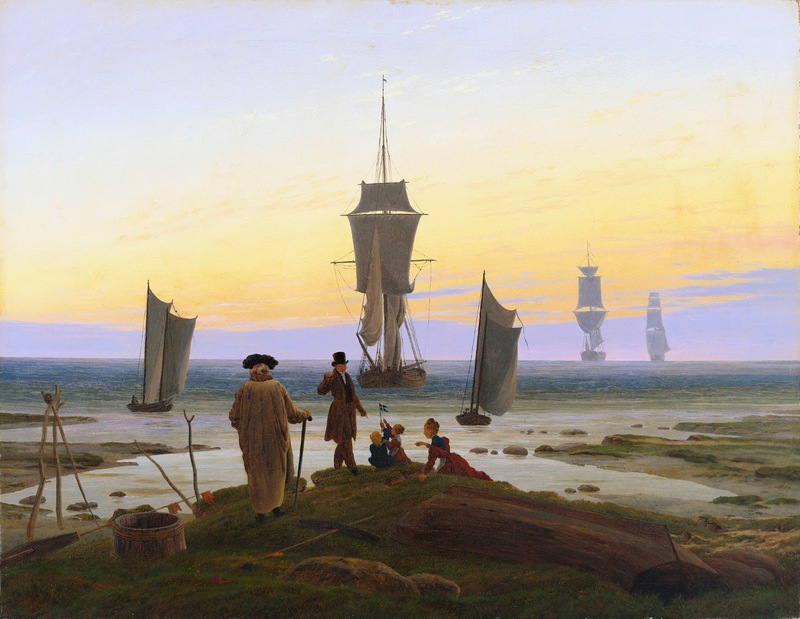 The figures are echoed by five ships shown in the harbour, each at a different distance from the shore, an allegorical reference to the different stages of human life, to the end of a journey, to the closeness of death. The Stages of Life is recognizably located at Utkiek, near Friedrich's birthplace of Greifswald in today's northeastern Germany. This area used to be part of Swedish Pomerania from 1613 until 1815. What a beautiful depiction. Certainly a tribute to his affection toward Emma (as central with the most clarity.) I especially enjoy the progression illustrated not only by the nearness to the horizon (or distance from shore) but the increasing sail area until we see the most distant craft under full sail - the same condition mimicked in the person of the artist, appearing himself to be fully decked out in sailcloth. This symbolism continues in spades suggesting so very much more that is probably best for the viewer of this masterpiece to work out for their own enjoyment. Suffice it to say, I see this expressing much vitality of spirit despite the infirmity of the flesh. Thanks Rob, I had never seen this before. I will remember it. Great post! It’s new to me too - beautiful. One of my fave artists. I saw a number of his paintings at the Alte Nationalgalerei in Berlin. The guard busted me for trying to take a photo (I didn't realize that gallery was off-limits for pictures. Sir Henry John William Graf Bentinck, K.C.B.